As part of Rotary’s commitment to community service, Sturbridge Rotary has formed a team for the last eight years to volunteer with The United Way of Southbridge, Sturbridge & Charlton to participate in their annual “Day of Caring” initiative. During the Day of Caring, volunteers paint, weed, mulch, plant or do whatever needs to be done in the community. 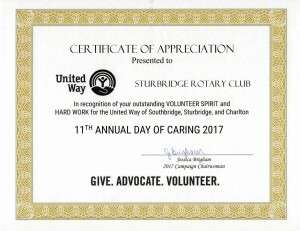 The first year the Rotary team painted three rooms inside the Sturbridge Senior Center; the second year we put up siding on a Habitat For Humanity home working alongside the future owner of the home. During our third year we painted skateboard ramps at the Sturbridge Recreational Center. Year four was quite a challenge for us as we built the first side of a colonial rail fence using the same construction as the historic Old Sturbridge Village. The temperature that day was 90 degrees. While it may have been hot and humid we tackled the project with enthusiasm and even finished it early. The weather in year five was fabulous for working. We had 12 Rotarians working on replacing the back side of the colonial rail fence as well as raking the entire park, digging three new flower beds and planting black-eyed susans. The completed fence replaces a similar fence around Sturbridge Rotary Park which we built in 2006 as a beautification project. Year six was a fun project at the Sturbridge Nursery School spreading mulch in the children’s play area. We split the team in year seven with one team delivering lunch to all the volunteers across all sites and team two cleaned the grounds of the Sturbridge Federated Church. We had two teams again in year eight. One team served as runners delivering coffee and then lunch to all the volunteers. The second team weeded all the American Chestnut Trees planted by the students at Tantasqua Jr. High School. The resulting work accomplished by all Day of Caring volunteer teams demonstrates dramatically how valuable gifts of time are. It’s a great feeling to know our Rotary team helps Day of Caring to create a huge positive impact in our community. A bonus for all volunteer teams is we have so much fun doing it!